Connecting Parents With The Classroom! Check out the new free Family Mobile App for your moblie device. Use the Tabs on the left for more information amd links. - For the Parents, Username and passwords are the same as last year. - For the Students, Username and passwords are set to STU and their Student ID. Example would be Username: STU123456 and Password: STU123456 and will require the password be reset. The Home Access Center or HAC, for short, is tightly integrated with the Teacher Access Center and the Electronic Gradebook system used by the teachers. It is designed to be easy to use and equally as easy in sharing information between teachers, school officials and parents. Current schools utilizing the Home Access Center are Breed, Pickering and Thurgood Marshall middle schools, Lynn Vocational and Technical High and Lynn English high school. The Home Access Center website is provided for the express use of the parents of Lynn Public Schools students to assist in the communication of important educational information. This website contains information and resources to help find questions you might have about accessing and using the Home Access Center. Please click the tabs on the left for additional information. Our Help Line number is (781) 268-4087 and will be open Monday thru Friday from 8 AM until 3 PM. Now you can access school information from mobile devices using the eSchoolPLUS Family app. Use the app to view attendance, classwork, class and activity calendar events, fees, student grades, and transportation information. Also, send email to a teacher by tapping the teacher's name. The student alerts you subscribed to in Home Access Center can be viewed directly in the app using the Notifications option. Use the Preferences option to change your student alert subscriptions and the email address on record with the school. The first time you open the eSchoolPLUS Family app, you'll need to select the district. You can search for the district by name and state or by location. 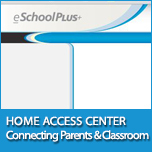 The user name and password for Home Access Center and the eSchoolPLUS Family app are the same. If you do not have a user name and password, contact the school district. Use Home Access Center if you have forgotten your password. Home Access Center allows you to reset your password after answering challenge questions. If you have access to multiple students, you can quickly switch the student in view. Student alerts for attendance, discipline, classwork, progress report, report card, and immunization information display as notifications within the app. Your subscriptions determine which alerts you will get for the student. The Notifications option includes a badge to show the number of unread notifications. Tap Delete on the Do you really want to delete this notification? pop-up. 2. Tap the option to display. The list of options that follows includes all options that can be displayed on the menu, and may include options that you do not have on your menu. Home. Displays school news, events, and assignments for today and tomorrow. Icons displays to allow quick navigation to other screens. Notifications. Displays student alerts for the student. Attendance. Displays student's attendance calendar. Calendar. Displays a calendar of the student's events and assignments. Classwork. Displays the student's class assignments in a week view. Fees. Displays the student's fees that have a balance due or credit applied. Progress Report. Displays the student's progress grade information. Report Card. Displays the student's grade information. Resources. Displays links to other resources that you might find helpful. Schedule. Displays the student's schedule. Activities. Displays the student athletic or club activities. Transportation. Displays the student's transportation information. Preferences. Displays options to change your student alert subscriptions and email address. Also, includes an option to save your username. On Android devices, this option displays on the overflow menu instead of the application menu. Logout. On Android devices, this option displays on the overflow menu instead of the application menu. Alert subscriptions can be changed from the Preferences screen of the app. Use the Receive Notification field to select subscription options for an alert. For Attendance and Discipline alerts, you can limit the alert so you are only notified for specific types. © 1990 - 2014 SunGard Public Sector Inc. All Rights Reserved. For these reasons, please remember if you choose to send an e-mail message to a member of our professional staff, you may not get an immediate reply. In fact you may not receive an e-mail reply at all, since the staff members will determine how best to contact you: by e-mail, phone, or to schedule a personal conference. 1. The Home Access Center access request form will indicate the e-mail address(es) that will be used to communicate with district staff. Only authorized e-mail addresses will be used by Lynn Public Schools staff to communicate with parents. Please send e-mail messages from an authorized e-mail account. 2. Please send only non-vital messages by this medium. For example, do not use e-mail to inform a teacher that your child is not to go home on the bus. A teacher may not have time to read your message in a timely fashion. Instead use the telephone to be sure your message is received and clearly understood. 3. Your child’s academic progress, learning expectations, or behavioral issues are best addressed through a telephone conversation or by scheduling a personal conference with your child's teacher. An e-mail message on these matters is not appropriate. 4. Please remember that e-mail is not necessarily confidential. Confidential information should be conveyed by phone or personal contact. 5. Please identify yourself in the subject line of your e-mail message and, if appropriate, the first name of your child. 6. For all medical or health concerns, please contact your child's school nurse by phone. 7. Please keep all contacts professional. Jokes, amusing or special stories, chain letters, or commercial solicitations are inappropriate and reduce valuable teaching time. 8. Mass e-mail to the district staff must be approved by the Superintendent of Schools before sending the e-mail. The School District maintains email accounts for teachers to facilitate parent/teacher communication and internal staff communication. The District reserves the right to block or filter email messages to staff that are not directly related to District business or to the District's educational mission. We hope you will find this updated user assistance manual useful as a reference to specific functions of our Home Access Center. An illustrated PDF of the updated manual is available for download below. ACCESS | Home Access Center is a 100% web-based program. You may access the HAC on any computer that has an Internet connection or on any smart phone or internet connected tablet. please make sure that if you are using pop-up blocking software or utilities such as Google or Yahoo! Toolbar allow for pop-ups. Browsers must allow pop-ups within the Home Access Center for printing. Our Help Line number is 781-268-4087 and will be open Monday thru Thursday from 8 AM until 8 PM and Friday from 8 AM to 3 PM.